DeskCycle 8 Levels Of Resistance – Magnetic Resistance – Extendable Monitor /Display – 24cm Tall – 11kg High end VIEW PRICE HERE! Aidapt Deluxe 12 Speed Settings – Remote Control – Programmable Timer – Works For Both Feet & Hands Mid range VIEW PRICE HERE! 66fit Adjustable Resistance – Works For Both Feet & Hands – Foldable – 2.8kg Affordable VIEW PRICE HERE! MiraFit 1.5kg Flywheel – Adjustable Resistance – Works For Both Feet And Hands – LCD Display – Carry Handle – 41 x 34 x 31cm – 6kg Affordable VIEW PRICE HERE! Confidence Adjustable Resistance – Works For Both Feet And Hands – LCD Display – 43 x 38 x 31cm – 6kg Affordable VIEW PRICE HERE! Exercise is important for many people, yet not everyone has the time to visit the gym. Even when at home, space is always an issue, which is why more and more people are turning to mini exercise bikes. These tools, also known as pedal exercisers, offer an experience similar to exercise bikes, but are small and discrete enough to fit anywhere, whether its home, the office or somewhere in between. Want to get started? There are many options available right now and here are the 5 best products the market has to offer. 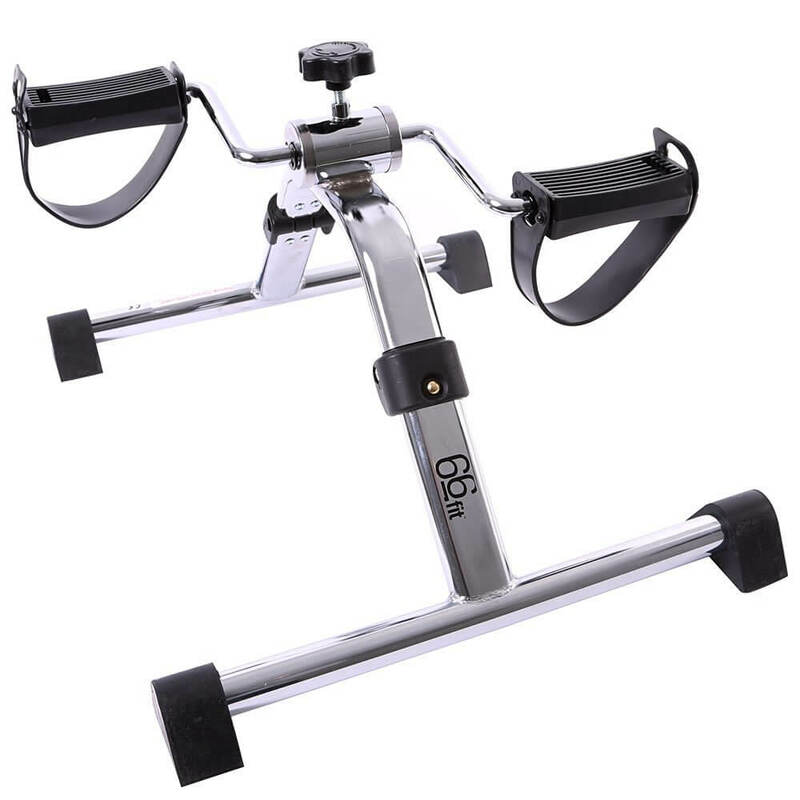 With 8 levels of resistance, this exercise machine lets you adjust your workout to suit your needs, which is great for getting the most of out any opportunity. Likewise, the magnetic resistance offers a smooth and quiet experience. Even if you use this in the office, or another busy environment, you won’t disturb others. Speaking of offices, this device comes with a clear display to give you easy to read information. Better yet, this comes with an extension cable, so you can move the monitor to your desk, or somewhere that is closer to eye level. This is a rather small product, making it easy to use in a variety of locations. At only 24 cm tall, you can easily fit this under any desk. Similarly, at 11 kg, this is also a rather light product, so there’s no problems trying to carry it around. This device has 12 different speed settings, allowing you to get the exact kind of exercise you want, or change it up mid-session. Likewise, the remote control is a very welcome inclusion. When you’re working your feet out, this allows you to make changes without stopping your flow. Similarly, the programmable timer is another feature that simply adds to the practical benefits. When you need to workout for a set period of time, this simple inclusion makes it so much easier to know when you’ve reached the end. Unlike some exercise products, this device has been designed with both feet and hands in mind. The pedals are ergonomic and intended to fit hands as well, allowing you to focus on a wider range of body areas. Overall, this device is easy to use and will become instantly familiar upon use. Despite its great features, it still maintains a small, lithe design that makes it a great option in a variety of situations. The resistance offered by this piece of equipment can easily be adjusted, thanks to a knob found in the middle. This is another product that is designed for both feet and hands so, if you’re looking for a way to work out your arms and legs, this is a great option for both. Furthermore, this device folds up when not in use, making for a very compact item. This is great for homes that can’t store large items, or busy offices where storage space is scarce. Similarly, with a weight of 2.8 kg, this is also one of the lightest options available. While it might sound simple, this is incredibly value for money. This tool does everything you could want and ensures a smooth, efficient experience while doing so. What more could you want? With a 1.5 kg flywheel, this device can offer some very powerful workouts, perfect for people who want to get some serious training done. This is supported with some adjustable resistance – controlled via a central nob – allowing you to progressively improve and adapt your program. This is also another product that is designed for both hand and feet, allowing you to train a cross-section of body areas. Furthermore, the central LCD screen is certainly useful and allows you to easily get all of the important data during any session. As an extra practical tough, this product also comes with a carry handle. If you want to move this from one location to another, this little extra touch makes it all the more easier. With a size of just 41 x 34 x 31 cm, this is also another small product that is easy to both store and transport. Similarly, with a wight of 6 kg, this is a very light trainer, again adding to its practicality. As you can see, this product has plenty to offer. Whether you want adjustable settings, an ergonomic device or a small, transportable exercise solution, the MiraFit offers it all. The dial on the front of the device makes it very easy to adjust the resistance, allowing you to fine-tune to just the right amount. This is another option for working out both arms and legs, making for a very useful and diverse fitness tool. The central LCD display is also useful, allowing you to keep track of your speed and other useful information, without interrupting your routine. It’s also got a reasonably small size, with a rough frame of just 43 x 38 x 31cm. Likewise, at 6 kg, it’s no heavy product. This cycle machine is easy to lift and carry, making it an ideal option for a variety of locations. To summarise, this is a device that will please many people, thanks to its agile design and sheer practicality. If you want to exercise in a busy environment, this product offers a discrete and effortless solution. 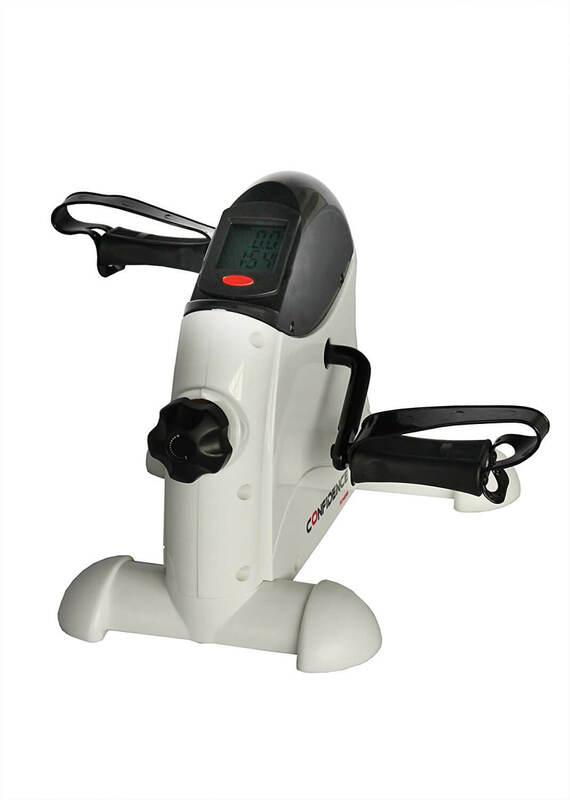 As you can see, there is plenty of choice when it comes to finding the right bike or pedal exerciser. However, even when looking at the very best options, some products stand out more than others. 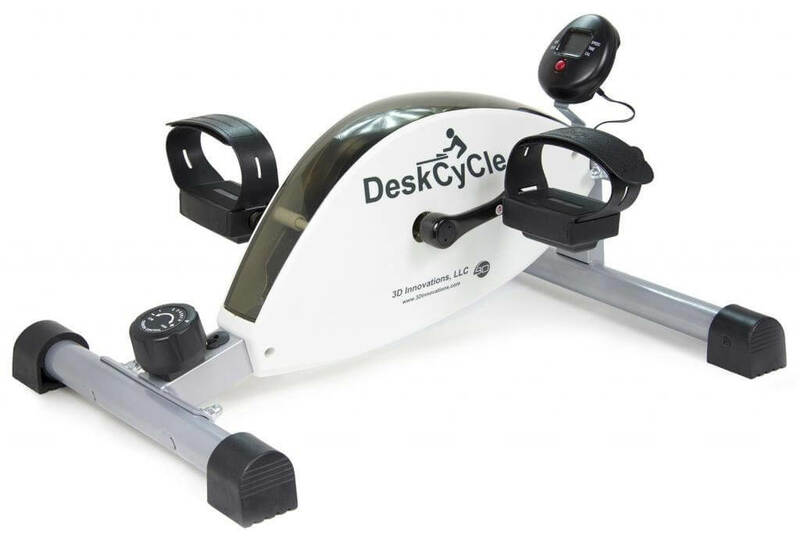 Specifically, the DeskCycle has a range of features that make it the best option available, including its unique design and agreeable price. If you’re looking for a powerful exercise machine that will fit anywhere, this is your best option.